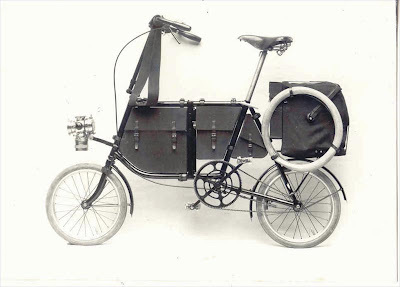 "1898 Fongers militairy bicycle, this bicycle could be separated in two peases [sic]. Picture came out of a recently discovered crate from the old Fongers-factory filled with glass negatives. What you see is also a picture made from the 1898 glass-negative." This photo was taken 112 years ago but this bike could be as useful today as it was back then. I love how the leather bags are integrated into the frame, and that there is actually a spare tire. I wonder what operated the headlight (kerosene?). It looks as if it were a single speed...look at the size of the front gear to the rear one...this thing must have flew. Add that one to those other nifty military bikes that you previously posted on. It kind of reminds me of a Raleigh 20 without the ability to fold. I can't imagine getting that thing started with the front chainring.